Relapsing polychondritis is an autoimmune disease in which an inappropriate immune response destroys cartilage. Cartilage of the ears, larynx and nose rather than spine and joint cartilage is affected by a chronic relapsing and erosive inflammation. Several animal models for relapsing polychondritis have been published in which immunization with various cartilage proteins induces a variety of chondritis symptoms that mimic those seen in patients. In this review we describe the collagens, matrilin-1 and cartilage oligomeric matrix protein as potential autoantigens able to trigger the tissue-specific immune response seen both in patients and in animal models for relapsing polychondritis and related autoimmune diseases. Relapsing polychondritis (RP) is a rare disorder which primarily affects cartilage in the upper respiratory tract, the ears and the nose. Joints are affected as well, but as a non-erosive arthritis. Like rheumatoid arthritis (RA), RP has been associated with the HLA-DR4 molecule in a few studies. In addition, patients with RP and RA present symptoms within the same cartilage structures, but with large variations in severity. Animal models that mimic the symptoms of the human disorder could be used as a tool to investigate the pathogenic mechanisms of RP. Several animal models for RP have been reported and the majority of them describe chondritis of the joints and ears [1, 2]. We recently reported that immunization with matrilin-1, a protein restricted to upper respiratory tract cartilage, induced chondritis in the respiratory tract and nose but not arthritis . The matrilin-1-induced model was the first report of an animal model with a chronic inflammatory disease specifically directed to the upper respiratory tract and which did not affect other cartilage-containing parts of the body, such as the joints. The aim of this review is to describe potential target antigens that are involved in the pathogenesis of RP and related autoimmune diseases in which cartilage is affected by inflammation. We will discuss how these antigens may contribute to the induction of different symptoms in the animal models and in the patients. We will give a summary of the characteristic symptoms that appear in the patients and that are of importance for the understanding of the different phenotypes in the respective model. Lastly we will address the heterogeneity and specificity of the cartilage inflammation detected in the animal models and in the patients. The most characteristic symptom is an inflammation of the external ear, subsequently leading to 'cauliflower' ears with sometimes severe tissue deformation [4, 5]. Large and peripheral small joints are affected by inflammation in an asymmetric, episodic and migratory manner. Contrary to RA, no rheumatic factor is detected in sera from RP patients and the arthritis is considered to be non-erosive, although erosions may appear in late stages of the disease. 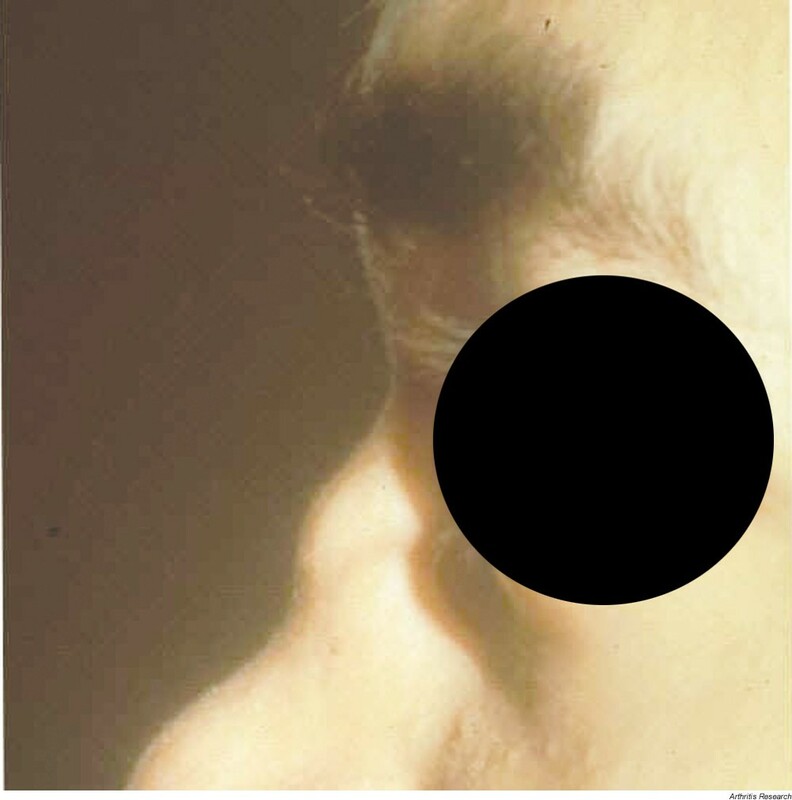 Inflammation and erosion of cartilage in the nasal septum is common and occasionally results in the appearance of a 'saddle-nose' deformity (Fig. 1). In half of the RP patients the cartilage of the tracheolaryngeal tract is affected. This is a potentially fatal symptom caused by a collapse of tracheal rings and bronchi and/or by inflammatory obstruction of the airways. These patients experience dyspnea, cough, stridor and (in some cases) symptoms from severe cyanosis. One fifth of the patients develop complications from nephritis, which is commonly associated with extrarenal vasculitis. Noncartilaginous structures such as the skin and cardiovascular system are commonly affected by inflammation as well, the latter accounting for a fatal outcome in some patients. All symptoms appear in episodes and are most often found as manifestations from chondritis at specific sites. Patient with RP presenting nasal chondritis and saddle-nose deformity. Reproduced courtesy of Dr S Foster, Immunology and Uveitis Service, Massachusetts Eye & Ear Infirmary, Boston, MA, USA. As for many other autoimmune diseases, there have been reports of a correlation between RP diagnosis and the MHC class II region [6, 7]. The serotype HLA-DR4 was found with a significantly higher frequency (50-60%) in RP patients than in healthy controls (25%) and HLA-DR-positive cells were detected in the auricular cartilage from an RP patient with active disease . No correlation to any subtype allele has so far been reported. Furthermore, 30% of the RP patients tested also have other autoimmune diseases, RA being the most common . Taking into account that the prevalence of RP is low, this still highlights a role for the MHC molecule in RP and also indicates that shared pathogenic pathways might be used in RP and RA. As large variations in the severity and targets of the inflammatory attack appear in patients with RP and RA, differently expressed antigens must trigger the immune system in these patients. Several cartilage proteins are considered to be potential target antigens in RP. Some of these are also proposed to trigger an immune response in RA. Animal models for RP have been described as those immunized with either collagen type II (CII) or matrilin-1 and as models that appear spontaneously [1–3]. These models differ in clinical features as well as in immunological properties, and the major phenotypic findings are described in this section. Three types of collagen are discussed as playing a role in RP pathogenesis: CII, collagen type IX (CIX) and collagen type XI (CXI). These types are almost exclusively detected in cartilage, where CII, a triple-helical peptide, represents 85% of the total collagen content whereas the minor collagens, CIX and CXI, represent 5-10% . They are assembled into cartilage fibrils that are mainly composed of CII fibers with CXI integrated internally and CIX situated on the external part of the fibrils. An increased immune response to CII is believed to play a role in RA; several investigators have also found antibodies to CII in patients with RP [10–13]. Anti-CII antibodies in RP patients are directed against both native and denatured CII, but, as in RA, it has not been possible to determine whether this reflects cross-reactivity of antibodies to the collagen triple helix or if there are also important antibodies specific to denatured CII. The epitope specificities of the anti-CII antibodies differ between RP and RA, which could contribute to the differences in arthritis phenotypes in the two diseases . CIX and CXI are also targets for an antibody production in RP patients [15, 16]. Surprisingly, a more prominent response was seen for CIX and CXI in a patient presenting a fatal tracheomalacia, indicating CIX and CXI rather than CII as being involved in chondritis of the respiratory tract . The humoral response has been the main target for investigation in RP patients, but recently T-cell clones from an RP patient were reported to respond to the CII peptide residues 261-273 bound to the DR4 (*0401) molecule . In a separate report, T-cell responses to CIX and CXI were found in a patient with severe tracheomalacia . Animals immunized with CII develop articular and auricular chondritis [1, 19]. The most dominating symptom is inflammation in the peripheral joints characterized by redness, swelling and pain, which mimic the symptoms of arthritis in RP patients. In the majority of the rodent strains, however, this inflammation is erosive and symmetric. This is in contrast to symptoms in RP patients, who instead develop a non-erosive and asymmetric arthritis. Auricular chondritis in mice as well as in rats has been reported. It presented as erythema, thickening and induration of the affected cartilage [1, 20, 21]. It appeared after the onset of arthritis, which indicates the mechanism of auricular chondritis to be a secondary phenomenon to joint inflammation. CII immunization can also induce inflammation in the nasal and tracheolaryngeal cartilage, but only at a microscopic level . Considering that cartilage tissue outside the diarthrodial joints is affected in RP patients, an immune response is likely to be induced against a cartilage protein expressed in the extra-articular cartilage. Matrilin-1 is a minor non-collagenous protein that, contrary to previously identified cartilage proteins, is mainly detected in the tracheal cartilage and is not found in the articular cartilage. To some extent it is found in nasal and auricular cartilage [23, 24]. Consequently, matrilin-1 is a major candidate autoantigen for the induction of inflammation in cartilage outside the joints. Matrilin-1 is a 148kDa extracellular cartilage-specific glycoprotein with high stability that, upon reduction of disulfide bonds, dissociates into three subunits [23, 25, 26]. Antibodies to matrilin-1 have been detected in sera from 13 out of 97 RP patients . In 9 out of these 13, symptoms in the respiratory tract were evident and in some cases fatal respiratory distress appeared. In addition, a humoral as well as a cellular response to matrilin-1 was reported in a single patient with respiratory symptoms . Furthermore, the level of circulating matrilin-1 correlated with pronounced respiratory symptoms in one RP patient, which indicated destruction of the tracheolaryngeal cartilage during active disease . In animal models matrilin-1 plays a unique role in the induction of chondritis in the respiratory tract. Recently we presented a new animal model for RP that mimics symptoms originating in the nose and respiratory tract. Both mice and rats immunized with matrilin-1 developed inspiratory distress that appeared in cycles . Symptoms in the rodents mimicked those seen in human RP, so the model was named matrilin-1-induced relapsing polychondritis. Rats of some strains also presented spontaneous nose bleedings and macroscopic hematuria, although these symptoms were not observed in mice. Joints were not affected in either species. In tissue sections, aggressive inflammation and erosions of the affected cartilage confirmed the clinical signs (Fig. 2). As measured by antibody response, all strains responded strongly to matrilin-1 and in some cases also to CII and CIX, but no correlation with clinical symptoms was found. Both MHC and non-MHC genes were confirmed to be involved in pathogenesis. We concluded that the rat model was dependent on CD4+ αβ T cells. In addition, monoclonal antibodies to matrilin-1 induced an erosive inflammation of the laryngeal cartilage when injected into adult mice, which indicates that antibodies specific to matrilin-1 are pathogenic in the murine model (Hansson et al., unpublished data). Sections of cartilaginous tissues from a female LEW.1F rat immunized with matrilin-1 . An erosive inflammation is detected in the nasal septum (a) and in the laryngeal part of the respiratory tract (b) with an influx consisting mainly of neutrophils but also of lymphocytes, macrophages and eosinophils. Hematoxylin and erythrosine staining. Reproduced with the permission of the American Society for Clinical Investigation Inc.
Cartilage oligomeric matrix protein (COMP) is an additional cartilage protein discussed in relation to RP pathogenesis. COMP is expressed in auricular, tracheal and nasal cartilage and consequently has the potential to trigger an immune response directed against all these cartilaginous structures . Only joints were affected in immunized rats, however . Circulating COMP as well as antibodies to COMP were detected in sera from RP patients [13, 28]. Several other models for arthritis have been reported but these will not be discussed here. We believe that they should be considered as alternative models for investigating the mechanisms of joint inflammation. Aggrecan  and the aggrecan-associated link protein  are two examples of such cartilage proteins that trigger arthritis in mice but that have not yet been investigated in RP patients. Adjuvants and oils can induce arthritis in many rat strains [33–36] and auricular chondritis in Wistar rats . Finally, in FH and Wistar rats, chondritis may appear spontaneously in the outer ears [2, 37, 38]. Cartilage specificity in these spontaneous models is not yet known. It is important to understand the development of RP, not only for improving predictive diagnosis and therapy, but also because its resemblance in terms of genotype and phenotype to RA might help us to highlight some pathways of common importance in the two diseases. Animal models of both RP and RA have been reproduced and are now powerful tools to elucidate the basic mechanisms of autoimmune chondritis. A major genetic influence in several autoimmune diseases has been reported. An association between the HLA-DR4 haplotypes and RA has been acknowledged for many years. Interestingly, a similar association has been reported in RP. The low number of RP patients as well as the paucity of studies on these patients complicates the genetic analysis. Studies of animal models for RP and RA show several differences regarding the correlation between genotypes and susceptibility to disease. Surprisingly, the DA rat, known to be highly susceptible in most arthritis models, was resistant to immunization with matrilin-1, whereas the LEW.1A rat, carrying the same MHC alleles as the DA rat, was a high responder . In the murine models, preliminary data indicate that similar strains, carrying the Q haplotype, develop disease in the matrilin-1-induced relapsing polychondritis and in the collagen-induced arthritis models (Hansson et al., unpublished data) . It has also been reported that HLA-DQ6αβ/8αβ doubly transgenic mice developed severe polychondritis (auricular as well as articular) after CII immunization. Severe arthritis was observed in the singly transgenic HLA-DQ8αβ mice, whereas none of the singly transgenic variants developed auricular chondritis . Taken together these data show that several genes, non-MHC as well as MHC, are involved in the pathogenesis of RP. Some of these genes are similar to the ones associated with RA, which indicates that similar pathogenic mechanisms may be valid for autoantigen presentation in RP and RA. We can also conclude that different genes in the MHC class II complex are involved in the induction of chondritis at different locations, suggesting that several autoantigens contribute to the clinical heterogeneity. For unknown reasons, cartilage in synovial joints is more easily accessible to an immune attack than extra-articular cartilage. Immunization with most of the cartilage proteins tested as well as several adjuvants induces arthritis but no extra-articular inflammation. This indicates that the joint possesses structural and/or functional properties that are not present in extra-articular cartilage. It has been proposed that the joint cartilage surface presents an environment lacking inhibitors of complement-mediated inflammatory pathways  or is more prone to attract antibody binding . The recognition of cartilage as an immunoprivileged site, and specific factors such as the possibility that the synovial lining harbors unique immuno-competent cells, also need consideration. What determines the initial triggering of a cartilage-specific immune response, its outcome and subsequent symptoms is poorly understood. Most likely the distribution and concentration of a particular cartilage protein play a role in determining the symptoms and their localization. This is demonstrated in the matrilin-1-induced relapsing polychondritis model, in which matrilin-1 plays a unique role in the induction of tracheolaryngeal chondritis. CII is regarded as a potential autoantigen in both RP and RA, but specificity of the CII autoantibodies that are produced differs between the two diseases. Interestingly, the CII peptide 261-273, known as a DR4- and DR1-immunodominant T-cell epitope in RA, was recently identified as the CII epitope for T-cell clones from an RP patient heterozygous for the HLA-DR allele (DRB1*0101/DRB1*0401) [18, 42]. This further supports the theory that a number of different epitopes are significant in the development of cartilage autoimmunity. Variations in epitope selection might explain the diversity in clinical outcome observed not only in patients with RP and RA but also in patients with the same diagnosis. The role of the CII peptide 261-273 in RP needs to be confirmed in separate reports and additional studies are needed in order to identify and define cartilage-specific epitopes in the initial phase of chondritis as well as in the recurrent relapses. In conclusion, RP is a disease that affects a unique combination of cartilaginous structures. Several cartilage proteins, some of which are also important for the induction of RA, play a role in RP pathogenesis. Animal models provide good tools in the search for potential autoantigens and candidate genes in RP, RA and related autoimmune diseases. Further knowledge of the cartilage-specific immune response will be useful in developing strategies for protecting selected cartilage tissue from an autoimmune/inflammatory attack, regardless of disease diagnosis. The manuscript was completed with the help of support from the King Gustaf V's 80-year foundation, Kocks and Österlund's Foundations, the Swedish Rheumatism Association, and the Swedish Medical Research Council.